Amid the recent circulating news of failure of the iPhone 6 Plus in its bend test, Unbox Therapy heeded to the people’s request to try bending Galaxy Note 3. Lewis Hilsenteger posted the video of Galaxy Note 3 bend test on September 3 and posted that he himself was surprised about the result. In the four minute video, Hilsenteger as quoted had used the same and could be more strength than what he had used to bend iPhone 6 Plus. He said that the two phones had similar form factor and he wanted to answer the question whether bending is something to be expected with phones of such size. He was amazed by the fact that Galaxy Note 3 was not damaged despite a few tries to bend. He said that it was a little bit warped but it actually survived that test. He also said that he did not expect the result since the phone is made up of plastic that turned out to be more durable than iPhone 6 Plus’ aluminum case. This video now has almost 4 million views since it was posted almost 3 days ago. Hisenteger also mentioned that after the previous video of bending iPhone 6 Plus, he tried to bend it back causing it to have a noticeable crack across its screen. He suggested that people should not bend back their bent phone. 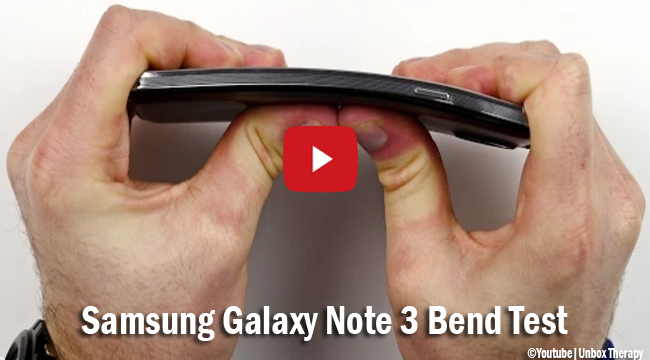 The Galaxy Note 3 bend test is an aftermath of increasing reports of iPhone 6 Plus users when their phone got bent after they had put it in their pants pockets. Lewis Hilsenteger posted his video which is now going viral with more than 32 million views, when he tried to bend his very own iPhone 6 Plus. It did got bent after he applied extreme pressure on it.